1. Fillet the fish. Cut the fillet with 4″ length. The cuttings could be used for burger. 2. Mix the garlic, brown sugar, soy sauce and pepper together to dissolve. 4. Sun or air-dry until dry to touch. Pack in polyethylene bag and seal. 5. Keep refrigerated for longer storage. Cooking it might be tricky, since you must have the right heat since too much will burn your cooking (there's sugar in it) and too low, you might not be cooking it at all. 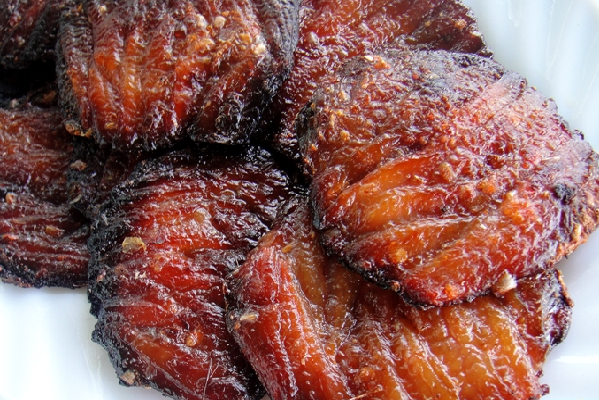 When its perfect, you'll have a dried seafood that's crisp yet meaty and the saltiness complements the sweetness of it being a tocino. Wow I really love your recipe. Thank you so much for sharing. I will try this today!